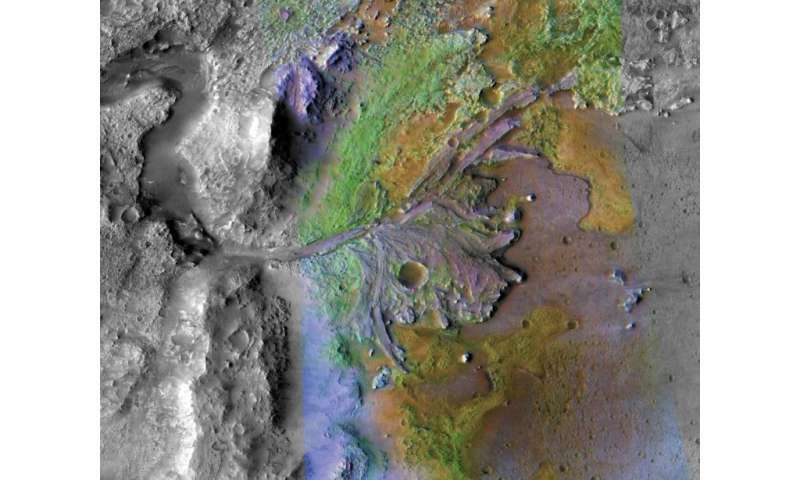 NASA has picked an ancient river delta as the landing site for its uncrewed Mars 2020 rover, to hunt for evidence of past life on Earth's neighboring planet, officials said Monday. "The delta is a good place for evidence of life to be deposited and then preserved for the billions of years that have elapsed since this lake was present," Ken Farley, Mars 2020 project scientist at NASA's Jet Propulsion Laboratory, told reporters on a conference call. At least five different kinds of rocks, including "clays and carbonates that have high potential to preserve signatures of past life," are believed to lie in the crater, just north of the Martian equator, the US space agency said in a statement. But first, the rover has to make it to the surface intact and upright, dodging a field of boulders, sand traps and the edges of the delta. Mars 2020 will use the same sky crane landing that successfully delivered NASA's unmanned Curiosity rover to a location called Gale Crater on Mars back in 2012. Gale Crater, with its many layers of sediment, was chosen to tell the story of how Mars transitioned from a warm, wet planet to the frigid and dusty one it is today. The landing site of Jezero Crater is different because of its abundant carbonate rocks and what they can hopefully reveal about early habitability on Mars, NASA said. Instead of having an analytical laboratory on board—like Curiosity has—Mars 2020 is designed to look at rocks on a finer scale, seeing what biosignatures are preserved. It will then pile them in a cache for further study back on Earth. A separate mission, yet to be defined, would bring the rocks back to Earth. Knowing more about the ability for life to exist on Mars in the distant past could inform us about how life evolved on Earth. "Mars is one of four terrestrial planets in the solar system and it actually has the best record of what was going on in the first billion years of planetary formation," said Michael Meyer, lead scientist for NASA's Mars Exploration Program. "During the same time that life started on Earth, life could have started on Mars," he added. "Mars had conditions more similar to Earth early on—in the first billion years—so what may have been happening in our solar system that allowed life to start on this planet may also be evident on Mars itself." Certain features of the Earth—such as plate tectonics which roil the terrain periodically—and flowing water which washes away ancient artifacts, actually make the search to understand early microbial life easier on Mars than on Earth. "Because there are so many ancient rocks on the surface of Mars, this information is more accessible," said Meyer. Robotic rover missions are an important part of human space exploration because these tools also help inform NASA's efforts to send people to the surface of Mars sometime in the coming decades. "Mars is really the obvious place, after the Moon, to go and expand our presence in deep space," said Thomas Zurbuchen, associate administrator of NASA's science mission directorate. NASA has vowed to send people to Mars by the 2030s, but industry experts say it could take longer—at least 25 years from now—before humans could survive on the Red Planet. These NASA scientists have little understanding about the development and start of life. You don't just get life from water being present. It's going to be a lot of wasted effort to try to "find evidence" of life. Yes, there will be many other interesting discoveries about our neighbor with this mission, and I fully support that work. But the hunt for life is just getting bizarre. @bart - it would seem that the presence of brain cells in one's head is not a sufficient condition for the existence, or formation, of intelligence. Water is not sufficient to sustain life but it's necessary. Bart, I wholeheartedly agree with your opinion as the potential value of the effort devoted to find 3 billion year old Martian fossils. The Public support needed for these singular, luxury custom-job missions is vital. NASA & Musk & all the rest have to provoke & encourage the Public's support with clickbait headlines to keep the funding coming in. "The Spice must flow!" Just change the word spice to money. An amusing offshoot of this will be if they only find ancient coprolite? Maybe that'll shut up the panspermia crowd's incessantly infantile whining? No. this is all about egotistical national one-ups-manship. The scientists involved have to tolerate the childish expectations of the vapid cheerleaders. Hey! Cheerleaders are taxpayers too. A serious attempt to explore & prospect would be industrialized. Sending out hundreds & thousands of cheap, limited purpose probes in a continuous process. Upon closer inspection, it will likely be found this is not a "river delta" at all. If it turns out that land formations on Mars similar to Earth archetypes, are proven not to be archaic lakes, rivers, deltas? That had miraculously survived billions of years, intact? How much more interesting that discovery would be! What unknown aresology events would have had to occur to mimic geology? Yhe Earth is has more than two thousand unique minerals. That can only exist after billions of years of tectonic activity & erosion. Exposure to shallow fresh water. abyssal saltwater & hydraulic chemistry deep in the crust. With constant processing by biological organisms. Without all that? Mars would be an unimagined prospect of opportunity to discover exotic minerals. A lot fewer of course . Whatever found would open new chapters in mineralogy. Uh, no, sorry, not gemstones. I doubt if there are any Mars 'bling' that could survive in the Earth's toxic, wet atmosphere. Such a string of discovery would help clarify (sober up) expectations on new worlds. What do you think it might be? It seems to be NASA's best guess for now. It's about time that they began the search for any possible life forms in or on the Martian terrain. Just North of the Martian equator is a very good start as the temperatures at or near the equator are fairly warm in the Martian summer. If there are any moist areas at all, it might indicate that water or some liquid seeps through and then later subsides back to its source. The photo is nice but it is a bit difficult to determine depth and height with a two-dimensional image. For me, anyway. Lol. What else would it be? I must admit that I have a bad feeling about the "sample return" of Martian rocks back to Earth. I would much rather that the cache be sent to the ISS to be examined there to prevent any possible accidental contamination of the Earth by hidden microscopic organisms that the instruments could not detect or missed. It is a different world, after all, and this rover is the first to actually investigate any possible life form, even if dormant. Tardigrades were sent up to the ISS. Most of them survived and, I believe, a few were desiccated, but still viable after placed into water. IF they send the sample to the ISS, if it had unknowingly been contaminated with a dangerous, viable life form, at least they could destroy the sample, even if they had to destroy the ISS. This is really risky business - in more ways than one. Do you figure life on Mars is witches, @SEU? The Earth is not the only place in the Universe where life forms were created. To believe that it is would be anthropocentric. Humans are too full of themselves as it is. SEU, on a larger view of the landing area there is an obvious area where the channel comes IN to the crater, and then there is also a large exit canyon as well, leading to a floodplain. So it did not just dump into the lake, the lake/crater had an exit river as well. These comments show a troubling pattern. That people claiming to be of scientific mind? Refuse to apply the scientific method to the available evidence. And, too keep an open mind, that any of us can be proven wrong in our assumptions. That we all need to continuously reevaluate our knowledge based on a constant stream of data. Of new evidence that will challenge what we think we know. A constant rolling juggernaut of scientific evolution that will run over and crush our most personally cherished opinions. It is useless to have a childish tantrum and wail "But my comicbooks have to be right! Just because most of the Universe is a dead loss? Doesn't mean we should flounce on home in a pique because the Cosmos refuses to obey our wishes. Even if only, reasonably accessible by robotic probes? All these dead worlds can be sources of new discoveries and unexpected realizations. Thanks for the reminder. That link you offered makes a difference with more detail than the photo in this article. Possibly similar to when Lake Pontchartrain burst its boundary and flooded New Orleans. And yet, we are told that the dust storms that occur on Mars tend to cover a lot of the landscape. After a billion years or more of that activity, those dust storms should have covered the shallower craters. 1. If the new Mars lander is built to dig down into the Martian rock/regolith at over 1 metre in depth - what could it possibly find that would be so much different from the regolith of the Gobi Desert (in terms of Chemistry).? 2. If its instruments were able to detect a life form on Mars - microscopic or otherwise, would NASA or any other space agency announce it to all of humanity, or will the "powers that be" disallow the information - possibly to prevent panic erupting amongst Anthropocentrists? 3. And, if Life is found on Mars, will Pope Francis or the Archbishop of Canterbury make a special announcement to allay the fears of the religious faithful? 4. Was Sir Stephen Hawking right about Aliens? 5. Do you want the old harridan, Theresa May out of 10 Downing Street as much as I do? "Lol. What else would it be?" The same process that shaped most of Earths canyons, rivers and streams, E/M forces and fields. Yes, it's difficult to accept the magnitude of such energetic occurrences, you have to stop thinking at the human scale and realise such events maybe just trifling stuff at cosmic scales. The advantage in robotic surveying & prospecting of of the small, dead, rocky worlds of Luna, Mars and Callisto? Would be to establish a baseline for failure. Each planetary corpse has it's own unique features and singular histories. Each has a contribution of knowledge to add to our database of the Cosmos. And for all that those worldlets share in common? Can provide us a better perspective for what we observe in other star systems. I have the evidence for the formation of canyons and river beds by E/M forces, and anyone who spends the time to go out and observe such features should be able to recognise the processes involved. Case hardening of rock faces by ion implantation, strong localised magnetic anomalies in basalt due to lightning, metamorphosis by heat, plasma etching of canyon walls. It's all there fro those with eyes to see. Nope, only for the scientifically deluded, brainwashed EU cultists. Show us where this has been written up. You know, mechanism, charges required, etc, etc. "Show us where this has been written up." Mainstream won't go near the subject, apart from the remnant magnetism. "The most frequent natural cause of an IRM is lightning discharge, referred to as Lightning Induced Remanent Magnetism, LIRM." I have personally researched this and other indicators of E/M modification of the substrate from ocean foreshore to mountain tops, and have absolutely no doubt about my conclusions. I do not care what anyone else, particularly you, has to say about the matter. segue amd solonut using their super-secret miracle technology to prove the efficacy of their lunacy. segue and solonut sitting at a card table. Hovering over their ouija board. Their fat little fingers shoving the pointer back and forth. Finally! The spirit voices echoing in their empty heads provide all the proof they need for their aether cult woo. "and more importantly, in order to scale it up to shape or form canyons as you're claiming, it would leave considerable evidence behind which would be easily found - and there isn't any found or reported in any reputable journal, which is likely your reason for stating.."
There are legends of the two headed serpent recorded from many cultures, the Maori tell of these serpents creating the rivers, the Salish tell of the spiraling serpent in the river bed, and how any living thing that came near it would shrivel up and die instantly. The two headed serpent would have its heads in holes in the river banks. I have photos of such holes and they are hexagonal, a sign of electromagnetic discharge. "no, you don't, otherwise you would have linked it here along with it's validation"
I have hundreds of photos and samples, some have been analysed, maybe I'll self publish some time, but university geoscience departments will not answer my requests for them to take a look at some of the locations, and I have been kicked off the USGS forums for suggesting electrical processes. Tells me I'm on the right track. Nope, it tells you that you are talking crap and they're fed up with wooists getting in the way of proper scientific discussion. Well, given the crap you believe, it would be impossible to have such a discussion. The same goes for a number of other posters on here. However, they all seem too chicken to take their nonsense to a real science forum. Instead, we just get scientifically impossible, braindead garbage spammed on here. Now, you're likely going to bristle at the above link, but your above argument is "self-sealing, designed to be impermeable to external reasoning"
So, if they accepted your request to examine the site and gave you evidence? Would you accept it or would you do like you do here and simply make some excuse to refuse to accept it? can you honestly tell me that if they told you it was formed by volcanic activity you would accept this? One of the major problems with Solon's woo is that there is no viable mechanism. And if one was to start invoking physics defying Velikovskian woo, in the form of Venus doing handbrake turns around the solar system, then one is rightly going to be passed off as a crank. The same applies to the idiotic EU contention that it was caused by electric discharge machining (lol). I will say bthis about the "scientific contributions" of the like of seu. solon, benni, granville, mr166, steelwolf, cantdrive, fredjose, otto and all the other woomongers that infest this site? Is to provide thesis material for the Mental Health and Social Sciences students monitoring these comments. Congrats boys! You actually, if accidentally, are are almost as smart as lab rats and gop candidates. Keep those incoherent rants extolling ignorance rolling on in. The graduating student's parents will be so proud when they see their offspring go up to the Chancellor to receive their diploma. While congratulating them for their award winning research into mental illness and social inferiority. seu. solon, benni, granville, mr166, steelwolf, cantdrive, fredjose, otto, you all have helped to make those accomplishments possible. So, everyone calling you totally clueless and useless waste of ectoplasm? Are themselves failing to see the big picture. MY advice to you, Solon, is the same advice I gave to rodkeh several months ago in one of these forums. If your evidences have merit and you feel that strongly that your work and gathered evidence has been occurring throughout Earth's geological history, then take it to bonafide scientists who deals with, and are experienced in what you believe to be true. You are not hurting anyone with your assertions. Pay no attention to the nonscientists in the physorg website. IF you have NEW science, then it is far better to discuss it with someone who KNOWS. so... your advice is to not take anyone here's advice, but to take your advice, which just so happens to be the same advice I just gave? the funniest part is: you're one of the worst "nonscientists" on this site! and a creationist nutter to boot! somehow your advice should be taken over anyone else because ... why? Haven't you finished collecting the Souls of the people who claim that they have some new scientific evidence and warning them to give it YOU or else they are liars and idiots? WHERE did you ever get the idea that I was pretending to be a scientist? and not everyone is a liar or an idiot; just the liars and idiots like you are. NO YOU DID NOT - YOU LYING PIECE OF SCHIT. NOW GIVE ME THE EVIDENCE THAT YOU HAVE HAD FAR FAR FAR MORE EXPERIENCE WITH EVIL THAN I HAVE HAD. YOU NO-GOOD SCUMBAG MISERABLE CUCK SUCKING LIAR. It is truly amazing to me how much name calling and ignorance can be exchanged over issues that are entirely speculative. Please guys, try and relax. Crackpots do not learn, nor are they interested in any kind of feedback on why their ideas are ridiculous. But, at least in my opinion, the proper response is to just put them on ignore. Not call them names. That just pollutes these comment boards with irrelevant noise. The real problem for me is that I can't just put everyone on ignore, because a lot of the people countering the crackpots usually have serious comments I wish to pay attention to on other articles. That means I have to go through all the name calling to carefully weed out the crackpots and its a chore. Oh Parsec., you are just too good for this wicked world. But, hey! I'm having fun in mocking the intellectually incompetent and the morally inadequate! You STILL haven't given me any evidence of your knowing how YOU have had far far far more experience in working with evil than I have had. And as I have NEVER mentioned ANY affiliation with any religion/faith, HOW have you come about such a lie that I am religious and have some kind of faith. Provide the link to that comment as evidence which I have never made. YOU always require substantial evidence from posters for THEIR assertions so that YOU can validate those assertions as though you were a scientist. Stumptydumptynumpty has been trying to take over the physorg website by deception for many years now, pretending to have such great caring and knowledge of science without showing any evidence of it - and by faking the importance of forcing those commenters to provide Stumpty with ALL of their scientific proofs/results so that Stumpty will be the ONE who validates and determines whether or not their work has any merit. Those who have come into this site with their science ideas/hypotheses/work for the purpose of discussions with like-minded individuals who may be able to give him/her some good science advice are waylaid by Stumptydumpty so that he may add them to his collection of Souls. Instead, those future scientists/engineers have to undergo the unscrupulous demanding behaviours of an irrelevant clown/nutcase such as CaptainStumptydumpty who evidently believes himself to be the saviour of the phys.org website. He has added many acolytes to his collection of Souls.